Primarily a wetland site, this is the biggest single conservation project the Trust has attempted. Longdon and Eldersfield Marshes were once Worcestershire’s largest and most important wetland; haunt of otter, bittern, swallowtail butterflies and rich flora. In late Victorian times the marshes were drained for agriculture. Although remnants exist, much of their former glory has been lost. The restoration of the marshes is being taken forward by acquiring land to establish core nature reserves. Other landowners on the marsh are being encouraged to adopt more wildlife-friendly management of their land. In 2001 the Trust purchased the 120 hectares of Hill Court Farm and the Blacklands. At the time it was being managed as an intensive dairy and arable farm. We’ve undertaken initial restoration works to recreate grasslands and to raise spring water levels but the habitats will take many years to develop and mature. We aim to recreate the grazing marshes, wetlands and wildlife-friendly farmland to provide suitable breeding habitats and wintering grounds for birds such as lapwing, redshank, wildfowl and farmland birds like skylark and yellowhammer. The reserve was named in honour of Andrew Fraser, the Trust’s Conservation Manager for almost 30 years, who sadly died in 2003. The purchase and establishment of this reserve was made possible with funding from The Heritage Lottery Fund, English Nature, Worcestershire County Council, Severn Waste Services, the Environment Agency, DEFRA and Aquila Networks. There is a screened viewing area reached via a hedged pathway. 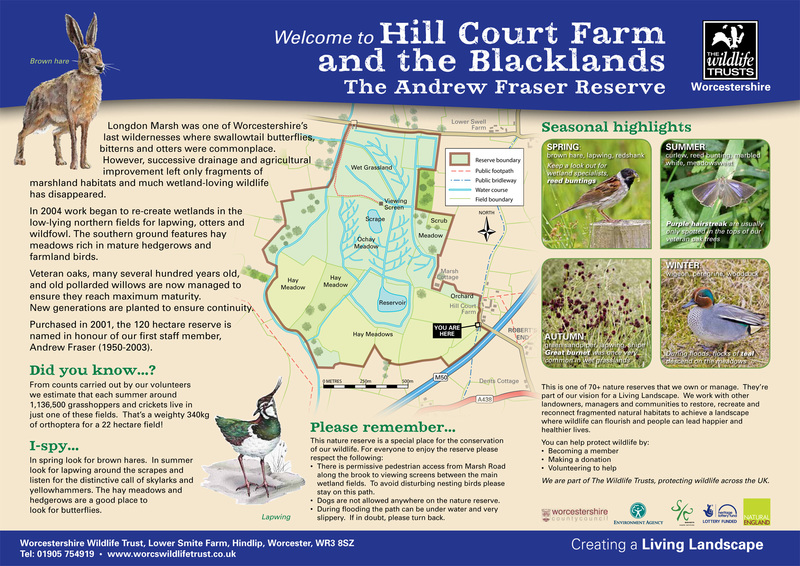 Why is Hill Court Farm a Flagship Reserve? This site will be used to show best practice for reversion of a site from intensive agriculture to grassland and wetland habitats. This is an adventurous project with on site development of water management systems with no adverse impact on neighbouring sites. The Trust has identified the Severn & Avon Vales area as one seven priorities in Worcestershire for its Living Landscapes approach. Here, the Trust’ has been working as part of a broader partnership focused on the Severn and Avon Vales – the Severn and Avon Vales Wetlands Partnership, now called Wetlands West (WW). Longdon & Eldersfield Marshes form the largest priority zone within the Severn & Avon Vales Living landscape area. Access to the reserve is restricted to a permissive path from Marsh Road to a viewing screen overlooking a scrape. As this site is managed for wetland birds, which are easily disturbed, we do not allow dogs on this permissive path or other parts of the reserve. There is also a public bridleway between Robertsend and Marsh Road, which runs along a high ridge, giving excellent views of the reserve and also run occasional special events allowing wider access. Muddy and slippery underfoot when wet, fields liable to flooding in winter and early spring. 2 or 3 spaces on Marsh Road by Longdon Brook.